Folks, this is the last day to preoder PREMEDITATIONS so that it will ship on December 15th! With these compulsively readable stories, Michelle Ristuccia creates a new genre in PREMEDITATIONS. This chapbook achieves a fresh look at our times, seeming to simplify while posing new questions about all we accept as reality — much as fairy tales and sci fi must have when first told. Ristuccia reveals forbidden texts, such as the complete “Articles of Faith” concerning cookies: tenets that are funny and a little sad, that cut to the core of our many belief systems. She dares tell first-person, true-life accounts of encounters with stick figures that become threatening; with a father who has a dangerous, rejuvenating secret; with immature non-human beings that in no way resemble anything we’ve come to expect. 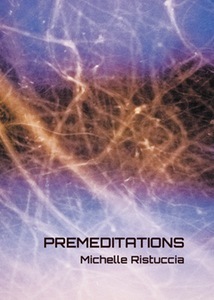 Whether humanoid, android, or otherwise sentient, PREMEDITATIONS is a must read. PREMEDITATIONS releases tomorrow, so get in your preorders now!